As addictions go, it could be worse. You could be dependent on something that might not end well. A drug-induced escape from reality comes to mind. Odds are, lifetime quality memories will not be produced in altered reality. Still, have a good first cruise experience and we want more. So we book again, maybe even before leaving the ship we are currently sailing. Doing so avoids the withdrawal process junkies of any kind go through after the high wears off. At least in the beginning. Over time it takes more cruise action to satisfy the need. Cruise addicts get picky, focusing on the parts they like best. They avoid the parts they don’t care for and can spiral down a dead end road that could ruin what was once our vacation of choice. Cruise lines, the enablers of our fixation, know this and have new reasons to feed your cruise addiction. It started with the Golden Fleece specialty restaurant on Carnival Legend. One alternative dining venue for ultra special occasions. A nominal fee was charged for cuisine so distinctly different from what was served in the main dining room that it made sense. A three pound Porterhouse steak for $15 was a steal and caught on quick. We were hooked and other cruise lines soon followed. Along came Princess Cruises Anytime Dining, offering cruise travelers the ability to dine when and with whomever they chose as opposed to being at the same table with the same people every night. 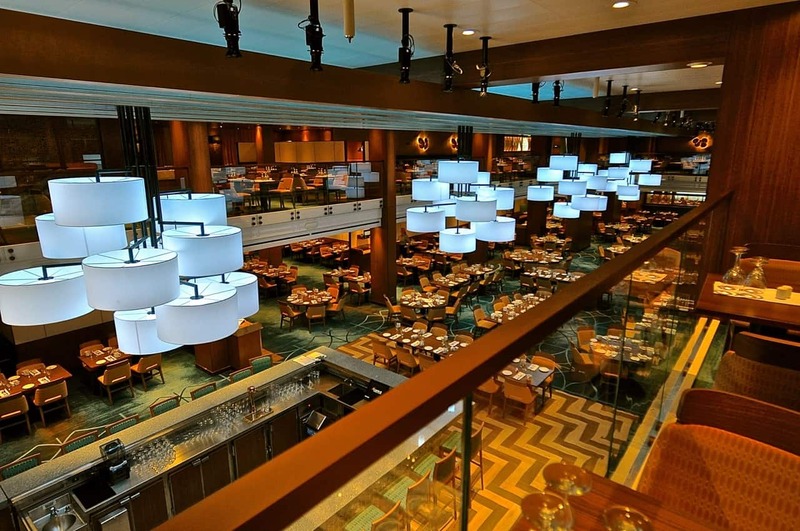 Norwegian Cruise Line’s Freestyle Dining began adding a plethora of choices, many for a fee, and drew fire from cruise fans convinced they ‘had to pay for the good food’. An onslaught of celebrity chefs brought a different element to at sea dining, increasing cruise line ability to charge more for what was customarily an included part of the deal. Then they took a step back. Additional dining venues clearly defined, cruise lines invested more resources in the included dining room experience. That effort leveled the playing field and brought the sizzle back to the dining room steak. Timing was improved so cruise travelers could indeed enjoy their evening meal and make it to entertainment offered at the other end of the ship. Bonus: new dining spaces being created have have a more contemporary feel. Going away are the large cavernous spaces where getting a drink other than coffee, tea or water takes forever. On new Carnival Vista, the bar is right in the dining room. Still, the ‘buffet’ of today is far from the straight line institutional cafeteria that aimed simply to feed a lot of people efficiently. For a number of cruise travelers, dressing up for dinner, or not, is a deciding factor when choosing a cruise line. A cruise line might have well-defined guidelines for evening attire but we really don’t know what other passengers will be wearing. It’s a huge issue with fashion-conscious travelers to the point where they might choose to err on the high side or formal, rather than be out dressed by their tablemates. Many cruise lines don’t help matters either, describing the suggested evening attire as the ambiguous “Casually Elegant”, “Country Club Relaxed”, or “Enjoyably Formal”. Huh? 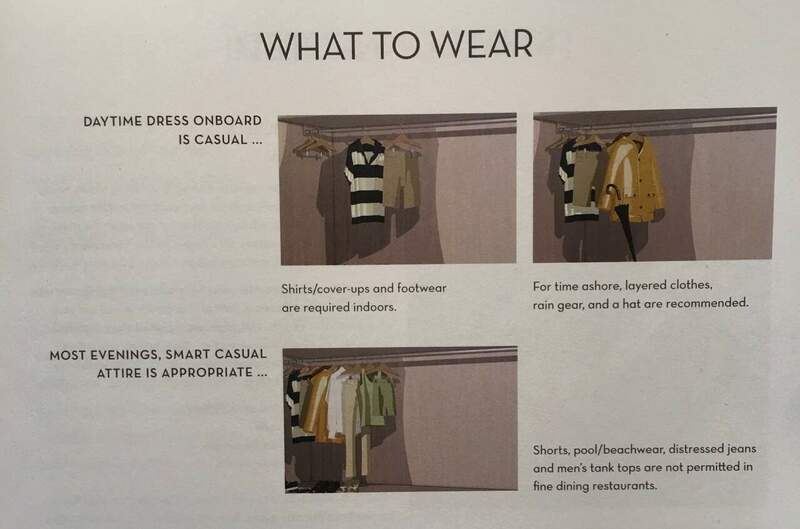 Good news for fans of Holland America Line: There’s a photo for the different evening suggested attire in each stateroom. It would be nice to see that on pre-cruise documentation or the Holland America website to avoid the inevitable “Dang, I wish I had seen this photo before I packed” issue but they’re headed in the right direction and we probably wouldn’t have paid any attention to it before being on the ship anyway. Cruise addicts who thought the only place they would feel comfortable is the buffet need to give the dining room another try, and for more reason than the dress code. While we still see passengers loading up a plates with enough food for a family of five then leaving half of it behind uneaten, their numbers are far less. On an increasing number of cruise lines that’s due to one simple change: they can’t. 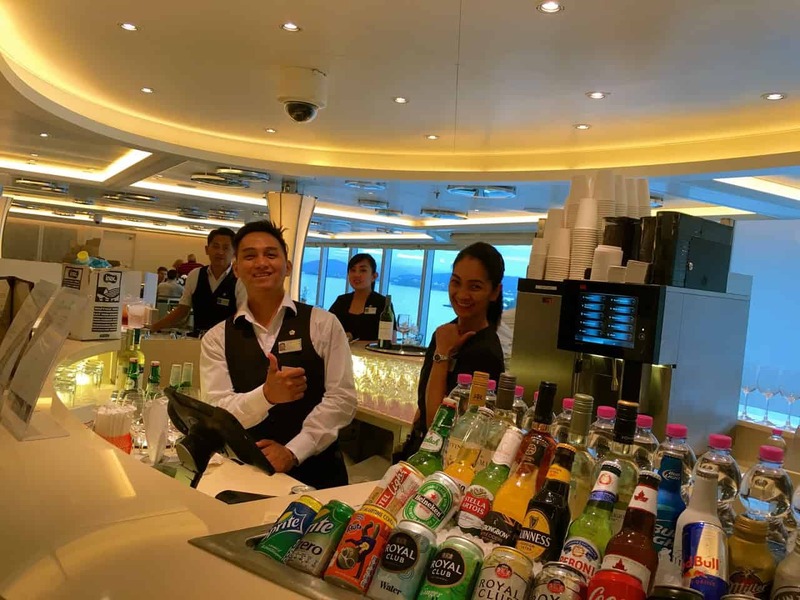 Not that they can’t have their fill and leave the dining area satisfied, they can, but more often they will be served by cruise line crew members. An increasingly popular service method has crew serving the buffet cuisine for the first day or two, depending on the results of that health questionnaire we complete before boarding. That effort greatly reduces the transfer of norovirus as the well-scrubbed hand of one crew member touches serving spoons as opposed to the hands of hundreds of passengers who may or may not have. Open kitchens bring the ability to finish menu items in front of us as opposed to being prepared in a remote kitchen and transported to the serving location. Well spaced stations enable passengers to easily skip sections of little interest rather than standing in line, waiting while their previous selections die on the plate. In the dining areas, tables are set with serviceware and crew stands by to bring drink orders. 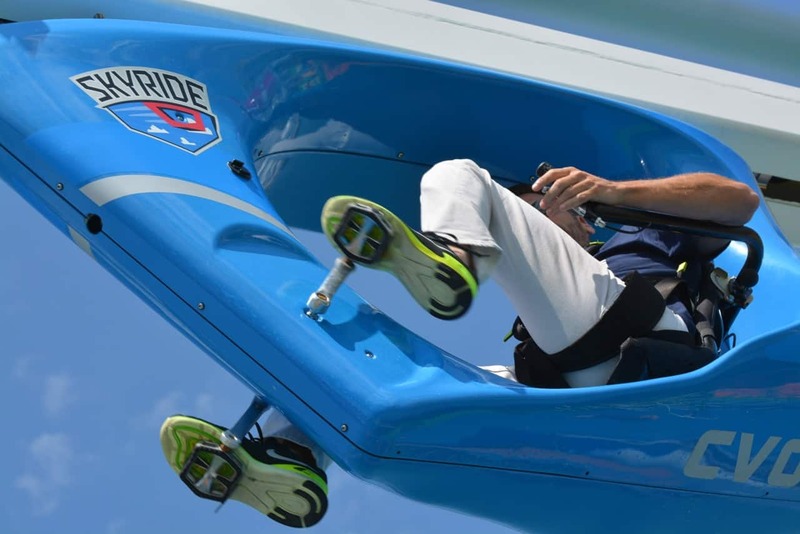 As opposed to a passive, sit there and enjoy it amusement park type ride on the top deck, cruise lines are adding active lifestyle attractions that require us to do something to enjoy them. Speaking of addiction and getting high, the twin SkyRides on Carnival Vista roll around the top deck of the ship, out over the side and provide amazing panoramic views of everything all around…if you pedal them. Just sit there and you go nowhere. The SkyRide as well a full size basketball court, Sports Square with ropes course and more are popular places throughout the day. Not that this is a first, the ships of Royal Caribbean International have had rock climbing walls for years. Still, as new top deck attractions added industry-wide in recent years tend take little effort, this new one takes some work. That comes as a surprise to some, sending them back down to the bar to consider some other activity, but not many. The cruise traveler of today is breaking away from the stereotypical ‘feed my gaping maw’ rendition of yesteryear. In the process, cruising as the travel drug of choice is changing too, offering a new respectability. For some. Others, still addicted to the old cruise travel experience can get it but they have to try harder. Eventually, they too will see the light, transferring their addictive nature to this new, more constructive cruise travel of today.